No 1 Kas Residence, is a luxury two bedroom, two bathroom duplex apartment that sleeps 4 and is located above the town in a peaceful residence of only 9 apartments. The amazing 180 degree Panorama adds to the tranquility along with the magical views that can be enjoyed whilst in the infinity pool. Fully equipped kitchen, Wi-Fi internet access, TV with satellite channels, DVD and Bluetooth music. Ceiling fans together with Air Conditioning make your stay more comfortable. I have owned this property for over 7years and always return at least 4 times year... you can never have enough of Kas! Regular maintenance and improvements makes this an ideal place to spend my vacations with all the comforts of home. With views to die for and the amazing turquoise clear sea, this makes for a relaxing and refreshing holiday. Kas has a special feel, being slightly bohemian but offering everything you need for your holiday. Town centre shops lining the cobbled streets, a good selection of restaurants,bars and coffee shops around the picturesque harbour and marina. The apartment is my home away from home and I hope others that stay here will feel the same. A well laid out duplex with quality furnishings including a Super King size bed in the master bedroom, contemporary fitted shower rooms and your own private patio for sunbathing and dining. The apartment is a positioned high above the town so takes advantage of the cooling breeze when the town is on sizzle temperatures, but we are only a 15 minute walk to the nearest beach. The kitchen is equipped to cook with oven, hob, fridge freezer, dishwasher and water cooler. Ceiling fans as well as air conditioning make night time very comfortable. Bathroom 1 en suite shower room to master bedroom with shower and WC. Bathroom 2 large family shower room with wet room shower and WC. Notes on accommodation: Please note this is a strictly non-smoking apartment. Our minimum charge is for one week. Outside: There are sun lounges on both the upstairs master bedroom balcony and garden patio. The garden has an abundance of flowering shrubs and fruit trees which leads to the spacious pool area where you can soak up the sun and cool off in the large infinity pool. Cleaning / Towels / Linen / Maid service: End of stay cleaning £40. Linen and towels including pool towels are charged at £9 per person. 14 day and over booking offer. A complimentary mid stay clean and fresh bedding and towels on day 7. Other: Spacious downstairs living area leading outside to a large secluded patio area and garden, an ideal for outside dining and sunbathing. The apartment was everything we hoped it would be. The location was stunning, the apartment well equipped and spotlessly clean and it's a straightforward walk downhill into Kas. Both the owner, Barry, and the managers in Kas were great and really helpful. Barry answered email queries quickly and sorted out airport transfers for us and Hilary (manager in Kas) organised a welcome package which was really useful as we arrived quite late. The sun shone, the sea was warm and we had a relaxing time in a beautiful place. Thank you .. we try and improve the property every year to ensure you have all you need to make it a memorable holiday in a magical location. 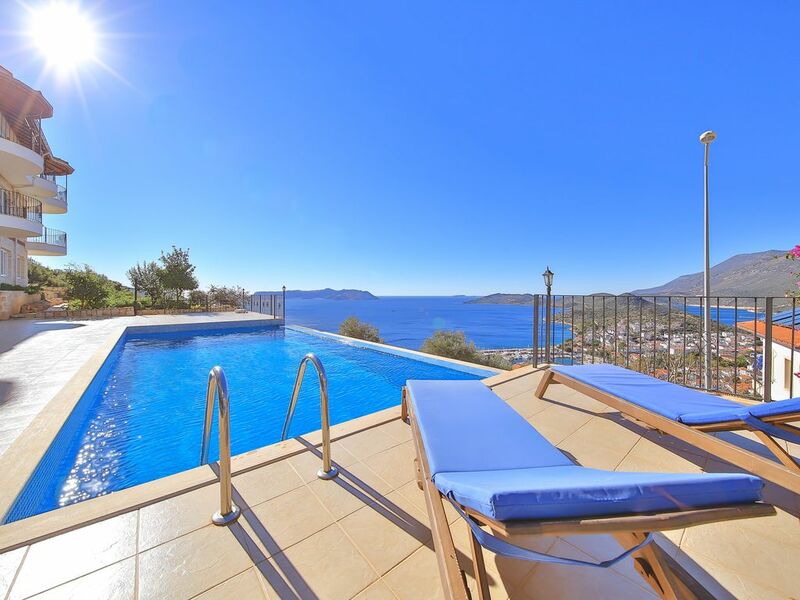 Our first visit to Kas and thoroughly enjoyed the use of this fantastic apartment. The view from the balconies, as from the brilliant infinity pool, is unforgettable. The quality of the interior furnishings and equipment also superb. Kas was a delightful location - extremely relaxed atmosphere, loads of great places to eat and plenty of opportunities for great shopping. The one-day gulet trips from the port round the local islands, with plenty of off-shore swimming and snorkelling, were a particular highlight. This was our first trip to Kas and we spent a wonderful 10 days exploring the town and surrounding area. The apartment was everything we hoped for and more - very well equipped and comfortable with lovely pool, private patio area and balcony with fantastic views of the town, harbour and out to sea. Kas has a lovely relaxed atmosphere with plenty of opportunities to explore the area on foot, public transport or boat. There are plenty of good restaurants and bars to choose from. The apartment and views were absolutely stunning, The infinity pool is gorgeous. Kas is a really vibrant town with plenty of really lovely restaurant shops and bars. Highly recommend both Kas and the apartment for an amazing relaxing break. Kas is a highly recognised dive centre for Turkey with the crystal clear water with man made and natural wrecks. Paragliding is a popular experience offering a birds eye view of the area. From the local harbour you can join one of many organised boat trips or you can even charter your own adventure. Daily crossings over to the Greek island of Meis gives a different culture to enjoy for lunch. Mountain biking Kayaking and walking are all available for you and can be arranged locally in the town. Just a 10-15 minute walk to a choice of local beaches. There are other beaches that can be reached by bike/car or you if you prefer you can take a short boat trip. Dalaman Airport is only 2 hours away by car. Antalya is slightly further approx 3 hours by car. You can always request a break for a drink and a stretch of legs if required. Airport transfers and car hire can be arranged at the time of booking your holiday. Kas benefits from all the facilities of a working town. There is an array restaurants offering something for everyone and ample bars some with live music. Several supermarkets are located in the town along with numerous banks. Pharmacies are very helpful and speak reasonable english. Every Friday the regional market offering fresh fruit, veg, clothing and an array of gifts comes to town. Booking Notes: Deposit of 25% of total cost required within 72 hrs from confirmation of booking. Balance required 60 days before departure. Bookings under 60 days from departure, pay the full balance to secure the booking. Breakage deposit of £200 payable with the booking and will be refunded within 14 days of the end of the holiday. End of stay cleaning is £40, Laundry and towels £9 per person. 14 day bookings include complimentary cleaning & fresh bedding & towels on day 7. Optional Internet charge £15 PW Changeover Day: Please contact us with your preference, we will always try and accommodate.